Gholām-Hossein Sā'edi MD (Persian: غلامحسین ساعدی‎, also transliterated as Gholamhoseyn Sa'edi and Ghulamhusayn Sa'idi; January 4, 1936 in Tabriz – November 23, 1985 in Paris) was a prolific Iranian writer. 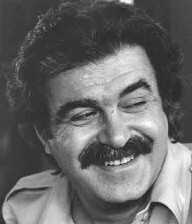 He published over forty books, representing his talents in the fiction genres of drama (under the pen name Gohar Morad or Gowhar Murad according to Library of Congress transliteration]), the novel, the screenplay, and the short story in addition to the non-fiction genres of cultural criticism, travel literature and ethnography. Many consider the screenplay for Gav ("The Cow"), Dariush Mehrjui's 1969 film, to be Sa'edi's magnum opus as it ushered in the New Wave Iranian cinema. After the 1979 revolution and his subsequent exile, he maintained an important figure in the scene of Persian literature despite the Iranian diaspora of which he unwillingly became a part. Till his death in Paris, due to depression and related alcoholism, he remained one of the most prominent and prolific of Iranian writers and intellectuals internationally. The late 1970s and early 1980s saw Sa'edi's last attempts to promote democracy in Iran. In 1977 he partook in the event Dah Shab-e Sher ("Ten Nights of Poetry") in Tehran organized by the Association of Iranian Writers in cooperation with the Goethe-Institut. The International Freedom to Publish Committee of the Association of American Publishers invited Sa'edi to New York City where he spoke and met American playwright Arthur Miller. After the revolution he joined the National Democratic Front, a leftist leftist party founded (in honor of Mosaddeq) in opposition to the Islamist right wing led by Ayatollah Khomeini. After the foundation of the theocratic Islamic republic and the execution of his friend, the playwright Sayid Soltanpour, Sa'edi fled to France via Pakistan. In 1982 in Paris, he founded the Association of Iranian Writers in Exile and reestablished the journal Alefba. Additionally, he co-founded the exilic Anjoman-e Te'atr-e Iran ("Iranian Theater Society") and wrote two more plays, in addition to several essays. Dandil:Stories from Iranian Life by Gholam-Hossein Sa'edi, translated by Hasan Javadi, Robert Campbell and Julie Maisami with an introduction by H.Javadi, Random House 1981. Hasan Javadi, Satire in Persian Literature, Fairleigh Dickinson University Publications, 1985. ^ 13 Day 1314 – 2 Azar 1364 AH. ^ Sa'edi, Gholamhoseyn. "Interview: Whose theatre?" Index on Censorship (14.4, 1985), p. 32. ^ Yad Nameh-ye Doktor Gholamhoseyn Sa'edi (Hamburg: Sonboleh, 1996), 49. ^ Gölz, Olmo. "Dah Šab – Zehn Literaturabende in Teheran 1977: Der Kampf um das Monopol literarischer Legitimität." Die Welt des Islams 55, 1 (2015), 83–111. Minoo Southgate translated Sa'edi's Tars va Larz. The title of the translation, which is preceded by a long introduction, is Fear and Trembling, published by Three Continents Press.